If I had any real worries about cycling into Albania (they weren’t for dramatic effect, surely?) they have certainly been dispelled by today’s events. I met Jean-François Le Strat while munching my way through a caramel croissant at the reception. In my defence I had thought the little yellow cubes on the packet were cheese and that the prefabricated French delicacy would have made a passable breakfast. It didn’t but I made the most of the calorie boost that it afforded. 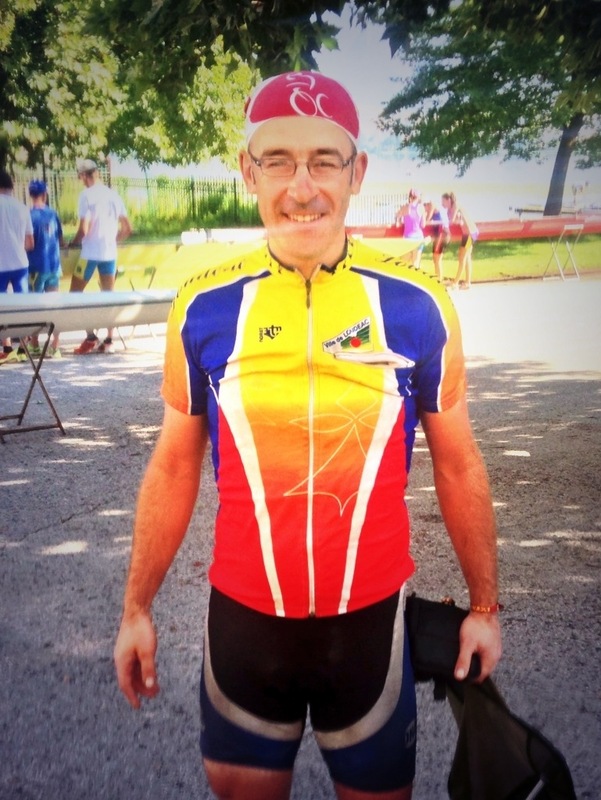 He was dressed in full Lycra – see below – and we chatted about his trip around Europe which made mine look like Les Vacances de Monsieur Houlot. He is spending ten months travelling around the entire content. Quite a feat and I’m sure he will achieve it. We shook hands and I headed off for the border with Albania. I groaned to myself when I noticed the sign informing that it was 50km to the point whereby I needed to turn left and then cycle another 30 or so kilometres. I had come to the conclusion that by heading inland to cross the border at Kakavi I was making work for myself. I could have just continued along the coastline I’m not totally sure why I didn’t. However, if I had I would have missed out on more spectacular Greek scenery all the way from Ioannina to the border with Albania. Extmely remote, very green, very quiet. A real escape from everything. I stopped at a bakery in a town half way between Ioannina and Kalpaki and fell into ‘conversation’ with a man who turned out to be Albanian. He spoke no English and I spoke no Greek or Albanian but we managed to communicate the fact that he had lived in Greece for 25 years and that I now needed to turn left to get to the border. What? ‘I’m only half way to Kalpaki’ (I didn’t say in either Greek or Albanian) to which he replied ‘No you are bloody well not; you are in Kalpaki and you now need to turn left’ (he didn’t say in English). How we managed to communicate this information is a secret I have yet to fathom but it was grateful news and I did what he said; turned left. This very last section of my cycle through Greece was the most beautiful yet. Stunning and unspoilt apart from the road upon which I was cycling having been carved through the area. Some curious mIlitary monuments (including a decommissioned fighter jet) dotted my path – more investigation needed on that score – and a very picturesque lake provided reasons to stop and enjoy the view. Eventually I could see the border post looming. It looked like a shopping centre planted in the middle of the mountains and to a certain extent it was just that with opportunities to prise you of your money on both the Greek and Albanian sides of the frontier. This was a proper border crossing. No Schengen informality. Passports checked by both the Greeks and the Albanians and a kind of no man’s land between the two. 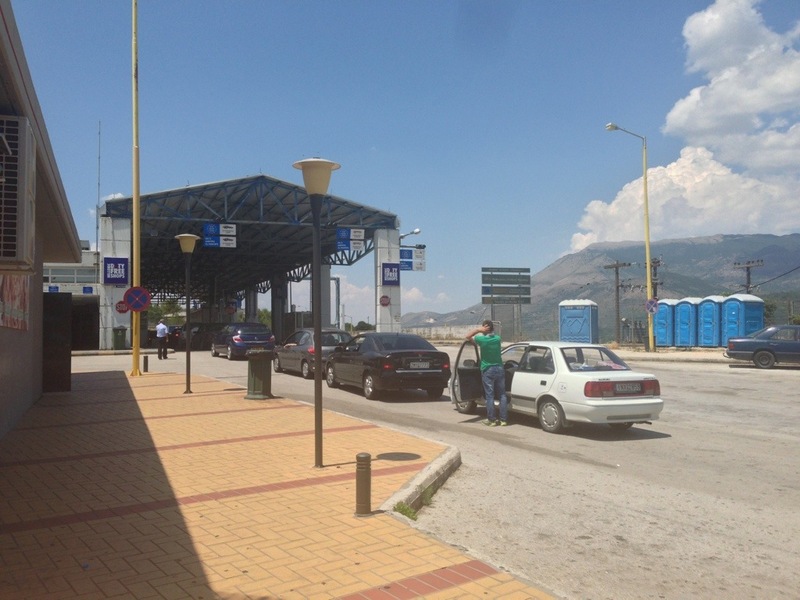 If a few years when Albania joins the EU all this will be swept way but for the time being let’s rejoice in the glory of a good border crossing. I love them! On my Michelin map I had noted how the green shading disappeared as soon as Albania started. I thought that this was simply because the it was a map of Greece and the Albanian side had only been given in the scantest of detail. Well actually this didn’t seem to be the case. The trees stopped as soon as I crossed the border and fell into the next valley. Is this because the Albanians have chopped them all down? I can only presume that it is the case as it would seen strange otherwise. The result was, however, a stark contrast between cycling in Greece and cycling in Albania. I had suddenly been plunged into a barren landscape of light brown. And it had suddenly become very windy in the wide valley. I stopped to buy some water in the first town I came to. Lots of abandoned buildings but strangely a brand new betting shop. The woman who served me was a delight asking where I was going and indicating that it would be a bit of a climb. It was. But spectacular. I climbed the 600 metres to the pass where I paused for another drink and another snack – two more of the pre packed croissants of all things (it’s all the petrol station sold as food) – and had a ‘chat’ with the two young guys staffing the place; so far they had had one customer all day. They told me all the Albanians were leaving the country as there was no money here. Or was it just at the top of that mountain? I think they wanted the stereotype to be true even if it wasn’t the case. The long descent to Saranda then started. It was much welcome after the earlier climb. The ‘Blue Eye’ didn’t have that much charm and so I simply cycled on to my destination where I found a bar, ordered a beer and found a room via the Internet. 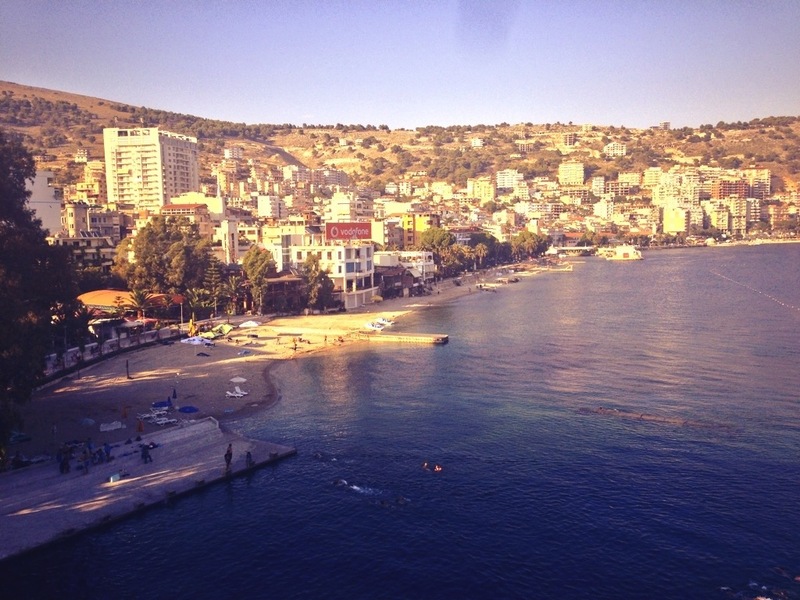 The town of Saranda is far from what you would expect of an Albanian town. I need to know much, much more about this country, its history and where it currently sits before I make much further comment. As far as I can see, whatever their future may hold, they have made a good start. I’m cycling from Belgrade to corfu. Your insights have been juicy. Cheers. There is a problem with illegal logging in parts of Albania. There is also a problem with legal logging as “deregulation of economic activities” picks up momentum. The contrast was sharp between Greece & Albania. Here it’s more of a North African landscape than a European one… Good news about the bag. When you do head back to the UK? Superb write up again Andrew, very interested in what you make of Albania. I doubt there are many back here who know much about it unless they have visited. 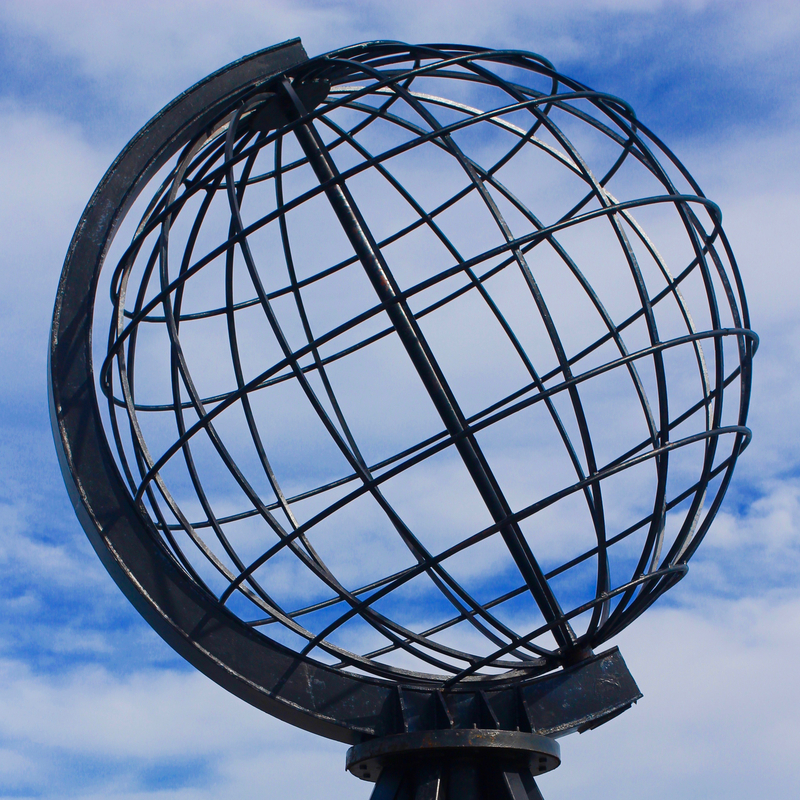 Great blog, entertaining, informative and educational. What more could we ask for?